Vaun Marion Ray, our beloved husband, father, grandfather, great-grandfather, brother, uncle and friend, peacefully passed away at the age of 92 on October 28, 2017 in Gilbert, AZ. He was surrounded by loved ones as he completed his earthly journey and happily returned to our loving Father in Heaven. Vaun was born to Edna Bertha Hansen and Marion Ray in Chandler, AZ on February 26, 1925. His happy childhood years were spent in Chandler and Mesa on the farm land that he worked and loved. Vaun graduated from Mesa Union High and immediately joined the Army to assist in WWII efforts. He and Ruth Richardson, his high school sweetheart and the love of his life, were married and sealed on August 14, 1944 in the Salt Lake City LDS Temple. 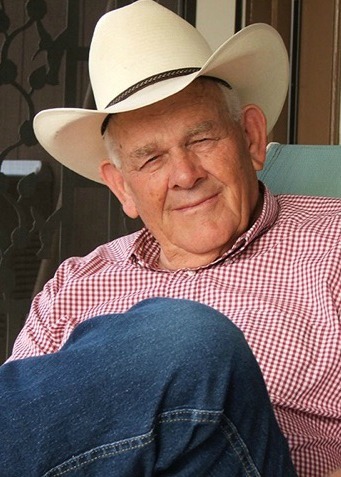 Vaun was a farmer in the Mesa area and loved working the land. He felt it a stewardship and worked diligently to maintain his crops of cotton, grains, and alfalfa. Vaun’s farm was also filled with memory making and love as it served as a gathering place for his children, their friends and extended family. Hayrack rides, cook-outs, fun games and laughter could be heard across the fields and in his home. He always had wheels to ride and animals for all his grand- and great-grandchildren. As an active member of The Church of Jesus Christ of Latter-day Saints, he served in many callings. Vaun loved the Savior and his faith and family were very important to him. He was quick to invest in them. He was a kind, patient, honest, hardworking man who always kept his commitments, he was generous with his resources, talents and love. Vaun is survived by his devoted wife of 73 years, Ruth Richardson Ray, children Vonda Dorny (Brough), Steven Ray (Susan), Kevin Ray (Ginger), 8 grandchildren, 19 great-grandchildren. Funeral services will be held Saturday, November 4, 2017 at 11:30am at the LDS Church at 230 N. Val Vista Dr., Gilbert, AZ 85234. A viewing will precede the services at 10:00am. Interment will be in the City of Mesa Cemetery. Vaun is a humble man with a calm and joyful humor. He was always ready to invest his smile in whom ever he met. Quiet by nature, he always was one to enjoy seeing others happy and enjoying being together. Encouraging with praise and kindness he always lead by example. A man of unquestionable integrity and a faithful friend. Always easy to follow, he found his success in helping others succeed. A man of great faith, he trusted in the Lord’s Way as well as His Timing. I will always remember him for his love of others and commitment to family. I have learned from his example that a man’s investment of time and love in family members is one of life’s greatest joys, truly, something we take into the future. Always proud to call him friend, his memory continues to be his gift to me to press forward in faith. Always in my heart, thanks Vaun for sharing life with me. My love and prayers to family and friends. I was privileged to know and to enjoy Vaun Marion Ray through the eyes and heart of one of his granddaughters… he had great love for his family and the Lord and an exemplary life that will always live on in the hearts of those who knew and loved him. An earthy journey well done! Now onto greater glory and will eternally be with his cherished loved ones! My love and prayers to family and friends.